Sematech's campus in southeast Austin (pictured) is credited with transforming the profile of the area, which is now known as "Silicon Hills." The subsidies for expansion are actually somewhat modest - at least measured against the $62 million in incentives that Texas ponied up in 1987 to land Sematech, a nonprofit consortium of the world's biggest computer chipmakers. This time around, Sematech is getting $7.3 million in local subsidies. The incentives will help facilitate an expansion that will create 125 new high-end jobs. Those relatively ordinary numbers notwithstanding, the project represents a highly significant step in Sematech's development. In addition, the expansion promises substantial spin-off benefits for Texas' capital city. The expansion will be implemented by Sematech's newly created for-profit arm, Advanced Technology Development Facility Inc. (ATDF). Currently, only Sematech's 10 member organizations (Advanced Micro Devices; Agere Systems; Hewlett-Packard; IBM; Infineon; Intel; Motorola; Philips Semiconductors; Taiwan Semiconductor Manufacturing Co.; and Texas Instruments) are allowed access to the consortium's research-focused chip plant in Austin. In contrast, privately held ATDF will provide access to paying customers. "ATDF will be the place where semiconductor research meets manufacturing," Juergen Woehl, general manager of Sematech's new spin-off, explained in announcing the new company's creation on July 8th.. "We'll serve chipmakers, equipment and materials suppliers, universities, and companies working in emerging technologies." All those players, he continued, "can take advantage of our custom products, our focus on protection of intellectual property and our fast cycles of learning." Sematech's new spin-off will markedly increase the speed of commercializing new technologies, Woehl asserted. Some 240 of Sematech's Austin employees have already shifted over to form the initial core of ATDF's staff. But further expansion for the spin-off hinged on getting local incentives. Sematech officials made no secret of the fact that they wanted for-profit ATDF to operate with some of the tax advantages that its parent firm receives. As a nonprofit, Sematech doesn't pay any property taxes. Local officials delivered. The Austin City Council approved a 100-percent personal property tax rebate for the $100 million in new equipment that Woehl says ATDF plans to buy over the next five years. Council members also approved $1 million from Austin Energy (www.austinenergy.com) for new energy infrastructure for ATDF. The utility's incentives are tied to the company's making energy-efficient upgrades in its operations. The City Council's authorization of ATDF's incentives, however, didn't come without some wrangling. Councilman Raul Alvarez, speaking during the discussion preceding the vote, compared the subsidies to "a guy who is trying to explain to his wife why he spent the rent money on a chinchilla franchise, 'No, no, no, after 10 years, this is really going to pay off, I swear.' I think you are buying a chinchilla farm today." Austin lacked enough affordable housing, asserted Alvarez, who also questioned whether a "formal structure" was in place to see how much economic activity was generated by the tax rebates that you have given in the past. . . . I would really like to see the council sticking to basic services and forget the chinchilla farms." The strongest criticism of ATDF's subsidies came from Susana Almanza, executive director of People Organized in Defense of Earth, an Austin-based activist group focused on environmental, economic and social issues. The unemployment rate near Sematech's site was nearly 15 percent, Almanza pointed out in her remarks to the council. "When you look at . . . giving . . . another $7 million," she said, "not added to [the fact that] they haven't paid taxes since 1988 on the property, and we are going through a hardship, I am very, very disappointed and very concerned about . . . giving out tax abatement and incentives. "Here is a private entity which already gets $100 million [in] federal subsidies of our tax dollars," Almanza continued. "And then on top of that, you are going to give $7 million from the taxpayers here in the city of Austin." Mayor Will Wynn thanked Almanza for her input and agreed that unemployment was high near Sematech's campus. But the mayor's take on ATDF's expansion was dramatically different. Sematech's arrival, said Wynn, compared to "the decision in 1840 to move the state capitol to Austin and in the 1870s to locate the University of Texas here. Those are very important decisions [for] the future economy of Austin. Sematech coming here in 1988 is that type of decision." The consortium's impact on Austin's economy is widely regarded as a symbol of high-tech economic development. Texas' capital city added some 100,000 tech-sector jobs in the decade after Sematech's arrival. Austin's population doubled as well during that span. The area around the company's Austin headquarters was soon known as "Silicon Hills," and the city has gathered in a rich cluster of technologically focused companies. In addition to Sematech, Advanced Micro Devices, Cypress Semiconductor, Freescale and Samsung all have chip plants in Austin. And of course PC king Dell is based in Austin. Sematech had never paid any property taxes, Wynn explained, "because [of] the nature of the business that [it] is in, the nonprofit consortium business." The mayor also contended that ATDF would fill a major gap in Austin's otherwise robust high-tech infrastructure. Different takes: While Councilman Raul Alvarez (pictured top) compared ATDF's subsidies to "buying a chinchilla farm," City Manager Toby Hammett Futrell (bottom) called the project "one of the most important proposals we brought forward." "We know that Austin has a relatively high number of patents generated, in part because of the University of Texas, the research going on up there," Wynn said. "But we don't have a good track record in the commercialization of patents that come out of the intellectual capital here in this town. "This facility at Sematech will not only help offset this, help to commercialize more of the patents that are here. We predict that ATDF's facility here will be attracting patents from other parts of the country [and] the world to come to Austin for their commercialization. So this is a pretty remarkable opportunity to take." ATDF's incentives, Wynn maintained, "will rebate property taxes that we were simply not going to have without this agreement, without this cooperation between us as a city and Sematech. . . . Where better should we have a co-investment like this? Where better should we find a partner like Sematech to first and foremost retain the employment that is in southeast Austin and grow it?" The ATDF project marked the third time that Austin has used incentives as one of its weapons in successfully attracting major expansions. The City Council awarded Home Depot a 10-year, $7.2-million property tax abatement as part of the home improvement giant's commitment to hire 500 employees for a new data center. In addition, the council earlier this year awarded Samsung Austin Semiconductor $4.3 million in subsidies as part of the chipmaker's agreement to add 300 Austin fab jobs over the next three years. But the city's incentives strategy has changed substantially, Austin City Manager Toby Hammett Futrell pointed out during the City Council meeting on ATDF's subsidies. "The council did pass a city-wide framework for economic development in the community less than a year ago," said Futrell. "What is different from the old days of tax abatements is instead of front-loaded [incentives], we have moved to an investment with rear-loaded, performance-based contracts. And that's what this is." Futrell further emphasized the importance of ATDF's expansion. "One of the things that we have here that makes us very special is our human capital," she said. 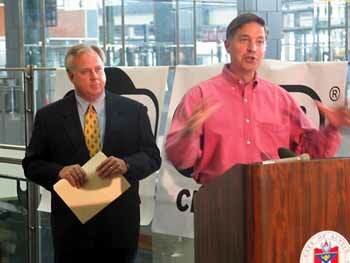 "We have more patents per capita than probably any other city in the country. What we don't do as well is taking that intellectual capital and getting it to market. That's exactly what this facility is going to help us do. . . . That's one of the reasons this proposal is more than just 125 new jobs. It's one of the reasons we think it's one of the most important proposals we brought forward." ATDF will serve as Sematech's primary R&D facility under a service agreement. The company for the past year has been in a pilot program working with member and non-member firms, equipment and materials suppliers, and universities. 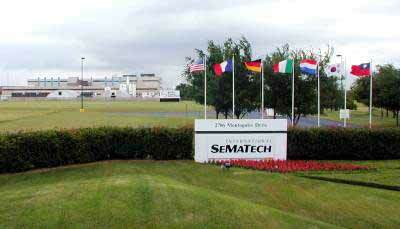 Sematech in 2002 expanded for the first time outside Austin, choosing Albany, N.Y., for a new US$403 million R&D center. The facility will be located at the Center of Excellence in Nanoelectronics (pictured) at the University at Albany, part of the State University of New York (SUNY) system. The artist's rendering above shows the university's existing 200-millimeter wafer R&D facility to the right, as well as the two 300-millimeter facilities (center and left) that are now under construction. "The success of the pilot program and the need for customizable research and development activities give us tremendous confidence in the success of this new venture," said Sematech Manufacturing, Operations and Technology COO John Schmitz. 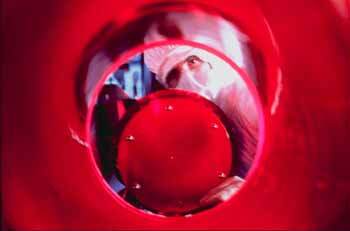 ATDF's Austin operations will include Sematech's 62,000-sq.- ft. (5,580-sq.-m.) Class 1 clean room, which has both 200-mm. and 300-mm. processing capabilities. The subsidiary's space will also include Sematech's Process Characterization Laboratories, which provide metrology and analytical services. "Our vision," said Woehl, "is to become the world's leading technology R&D center." Sematech earlier this year launched the Advanced Materials Research Center (AMRC) in Austin in partnership with several public and private universities in Texas. (For more, see the Texas Spotlight from the September Site Selection .) The AMRC will pioneer next-generation semiconductors, as well as supporting the state's efforts to carve a niche at the intersection of nanotechnology and life sciences. The Texas Enterprise Fund is putting up $40 million of the $160 million needed to start AMRC, which should generate 4,000 technology jobs over the coming decade.